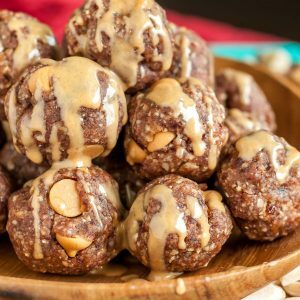 Tasty No-Bake Peanut Butter Energy Balls make a fabulous gluten-free lunchbox treat or post-workout snack! We love snacking on these PB date bites all week long. Toss your almonds and walnuts into a food processor and pulse until they appear finely chopped. Next add dates, dried cherries, juice and salt. Pulse your heart out with the food processor until the mixture is well-incorporated and a bit sticky. Remove the mixture from the processor and spread onto a piece of wax/parchment paper or cutting board. Next you'll want to add the luscious peanut butter chips. Since they're sized a bit awkwardly for folding into the energy bite mixture, use your food processor or a sharp knife to give the PB chips a rough chop so they resemble peanut butter chunks. Incorporate the two and then roll into bite-sized balls. Scarf some as a snack right away, and store extras in an air-tight container.